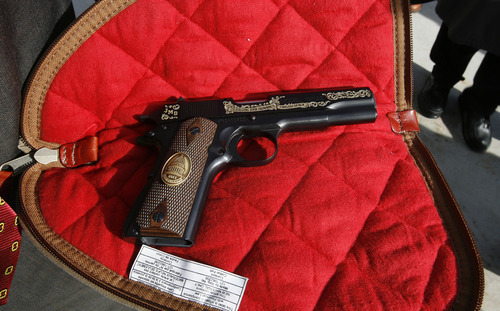 Scott Sommerdorf l The Salt Lake Tribune The commemorative .22 cal Browning handgun given to the Governor by Christopher Browning, the great grandson of John M. Browning. Utah Governor Gary Herbert made a formal presentation of the resolution declaring Monday. 1/24/2011 as John M. Browning Day to Christopher Browning, the great grandson of John M. Browning, at the noon ceremony on the capitol steps. The bill was amended as it moved through the Legislature to recognize that Browning never actually manufactured the gun but designed it and gave the blueprint to the military, which had Colt, Remington and even International Harvester and sewing-machine-maker Singer manufacture the weapon. Legislation is pending in Arizona to designate the Colt single-action Army revolver as that state's official firearm  a recognition that advocates have criticized, coming on the heels of a Tucson shooting spree that left six dead and wounded U.S. Rep. Gabrielle Giffords, D-Ariz., and several others. Also on Wednesday, Herbert signed bills changing the criteria for the crime of prostitution; acknowledging a longstanding error in the state flag; honoring former Utah Jazz coaches Jerry Sloan and Phil Johnson; and urging the federal government to remove wolves from the list of endangered species.